One of our supporters and donors is hosting a fundraiser for Toby's Foundation. Celebrate our pets by earning funds to support Toby’s Foundation. Pam Tupy, Independent Sales Consultant for Norwex, will donate 15% of all sales and this will be matched by three private donors up to $500 each during the specified fundraising period. Help raise funds for Toby's Foundation in the fight against Canine Epilepsy! Thank you! The fundraiser will run from May 2 to May 23. Norwex stands for “Norwegian Experience” and features high-quality microfiber products (and more) that remove 99% of bacteria from a surface with only water! Reduce chemicals, save time and save money. Norwex also carries a line of pet products designed to safely and effectively groom and clean our pets. The fundraiser will run from May 2 to May 23. There are 3 ways to get more information. 1. Like our Facebook page and then follow "Pam Tupy- Independent Sales Consultant for Norwex", on Facebook when she launches the fundraiser on May 2nd. She will initially post on our page but then will post all future updates directly to an event created on her business page so that she doesn’t inundate our feed with the fundraiser information. 2.Email Pam Tupy directly to ask specific questions and get custom product recommendations based on your needs. 3. You can also directly order off of Pam Tupy's website if you want to shop around on your own. Visit her site for the event “Toby’s Foundation”. 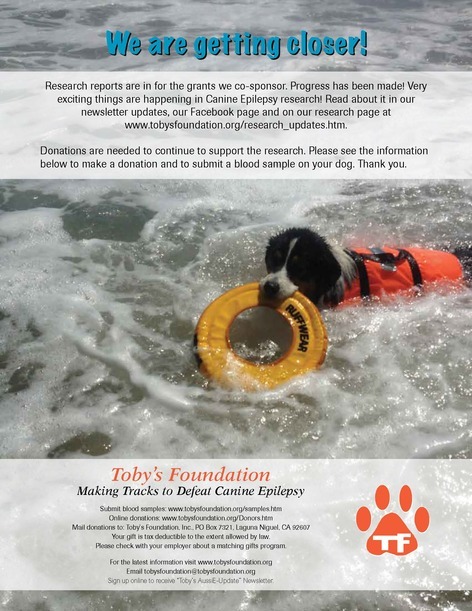 Research reports are in for the grants we co-sponsor and exciting progress has been made in Canine Epilepsy research. "Using a novel whole genome sequencing approach we will identify DNA variations in epileptic dogs that could affect the function of genes such as ion channels and neurotransmitter receptors that have been shown to alter the seizure threshold in humans or rodents. We will then directly compare the frequency of those variations in populations of epileptic and non-epileptic dogs rather than using the indirect markers used in traditional mapping studies. We predict that the increased power provided by looking for specific candidate variations rather than linked markers will permit the identification of epilepsy risk factors. These can then be developed into DNA tests to enable breeders to select against those risk factors." impacts on QoL beyond seizure frequency, we will also investigate whether the MCT supplement alters the side effect profile of AEDs the patient is already receiving, improves any behavioral problems associated with epilepsy (e.g. anxiety), cognition and improves the stress levels of the affected dog and their owner. If successful, MCT supplements could be a vital new addition to the tool-kit of epilepsy treatment. "